Herb gardens are a fantastic addition to any home. With a windowsill herb garden, you’ll have easy access to fresh garnishes. Herb gardens are a fantastic addition to any home. With a windowsill herb garden, you’ll have easy access to fresh garnishes. There are four herbs which grow particularly well in a windowsill — if you know how to care for them correctly. Although you can grow mint from seed, it’s easier to start with a small, established plant. Mint is a spreading perennial — meaning, if left unchecked, it can quickly overtake neighbouring plants like a weed. Place mint near the edge of your planter box so that the stems cascade over the edge. Make sure you prune the stems where they might make contact with the soil of the plant next to it because they’ll start to take root. Mint likes damp soil and is a relatively easy plant to care for, and once it’s growing happily you won’t need to do much except enjoy using it. Basil is a tropical plant which doesn’t like the cold, meaning it’s perfect for growing inside on a windowsill. It is a little harder to keep healthy than mint but is still a reasonably easy herb to grow. Again, this one is best grown from a small plant — you can pick these up from Bunnings or a local nursery. Once you have your baby home, ensure the soil is quite moist. You’ll want to place it in a position where it gets a minimum of six hours of sunlight, and don’t forget to water it regularly in the warmer months. 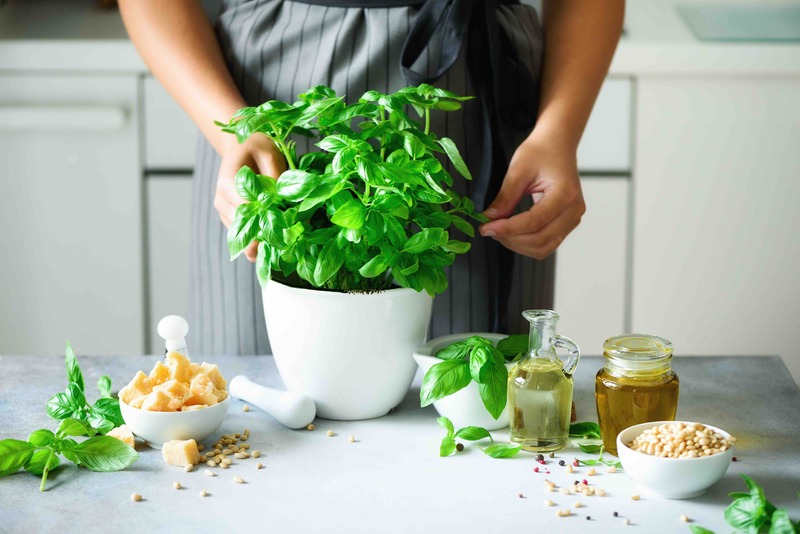 You’ll also want to pick the leaves regularly (which should be no issue — basil makes a great accompaniment to any pasta dish and many salads) to encourage new leaves to grow. This perennial member of the onion family will make a tasty addition to your herb garden. Primarily served as a garnish, you can add this to scrambled eggs, salads — almost anything — for an instant gourmet upgrade. Chives are a cool season cold-tolerant herb that should be planted in early spring. Just like mint, it has the capability of taking over soil, so make sure you prune the flowers (which scatter seeds) as soon as you see them. This herb prefers full sun and damp soil. We’ve saved the best (and the hardest) for last. Coriander is a delicious herb which can transform a dish but, unfortunately, it is also one of the hardest herbs to keep from going to seed. It’s best to grow this one from scratch. Buy coriander seeds from a quality nursery for your best shot at keeping this one going, and plant it in a pot that’s about 25 centimetres across. Fill it to about three centimetres from the top with premium potting mix and sprinkle about ten seeds across the top. On top of the seeds, put another layer of potting mix and water with a seaweed solution. Put the pot in a warm but sheltered position in our home. When the seeds have grown to two centimetres tall, it can join the rest of your herbs in your windowsill collection. Water regularly with the seaweed solution and organic liquid fertiliser. Read more about indoor plants here.